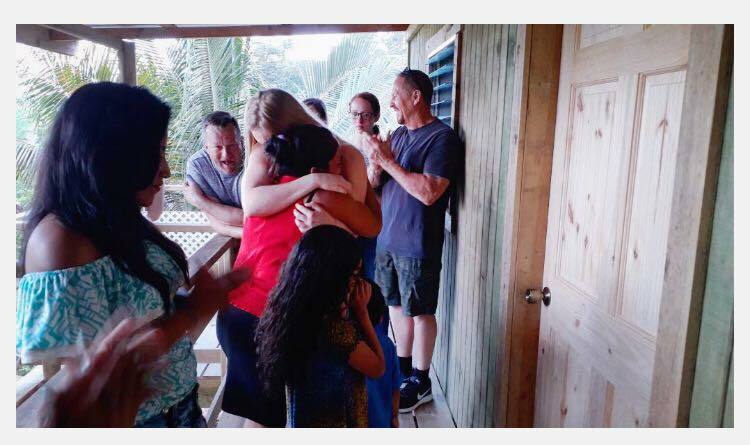 This past week, A father and daughter team from Iowa, led by Brad Coates, joined us in Roatan, Honduras to build a home for the Argueta Family. 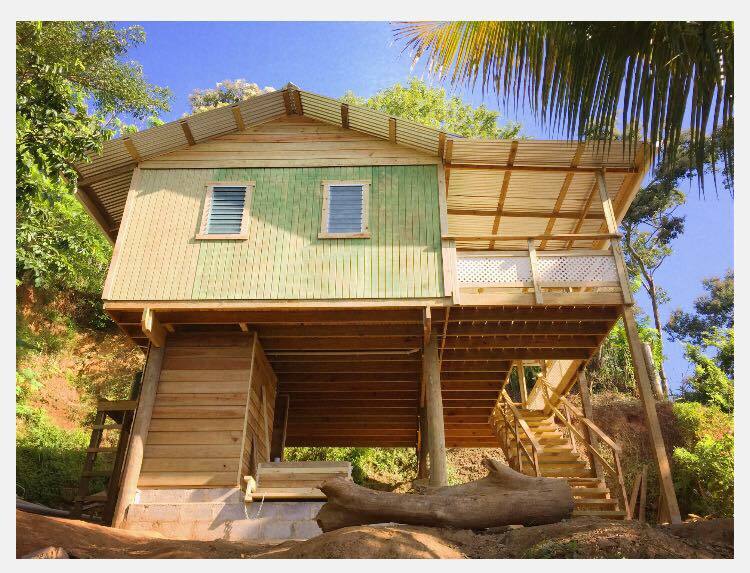 This could possibly be one of the most beautiful homes Dwellings has built in Roatan over the past decade. This team did an AMZING job and became an inspiration to so many. Here are some highlights, compiled from Facebook posts by our build coordinator, Lilian Pavon of the build. Day 1 and 2 have been very PRODUCTIVE!!! The team has accomplished a lot in two days. On day one they got all four exterior walls up, center beam in, middle interior walls up, some tongue and groove done, rafters, stringers and blockings and cemented the posts for a water tank tower and on day two they got all the interiors tongue and groove walls done. They finished the roof as well. They are building a downstairs bathroom. Windows were installed and trimmed. They installed a solar system for the family as well!!! Way to go team!!!! The Argueta family is very thankful for everything you're doing for them!!! Looking forward to our day 3! Day 3 and 4 have been just PHENOMENAL!!! The railing got done, tile for kitchen cabinet and bathroom got done, bunk beds are done, ship lap for downstairs bathroom is done, interior doors and front door got installed just bathroom door left. Most of the solar lights are installed just got the bathroom one to finish, closets and kitchen shelves are done and gutters are installed to the water tanks as well !!! What an AWESOME week it has been. THANK YOU, THANK YOU, THANK YOU Mr. Brad and rest of the team for being such AN AMAZING BLESSING to the Argueta family. THANK YOU for your care and love for Ana and her children. We are having a BLAST working side by side with you!!! Day 5: Yesterday was such a NEAT and SPECIAL evening!!! The team dedicated the house to Ana and her children. It was great to see their joy and happiness of getting the keys of a GORGEOUS and COMFORTABLE house!!! A BIG THANK YOU AGAIN to the AWESOME team from Iowa, each one of you did a FABULOUS job. THANK YOU, THANK YOU, THANK YOU for making such a HUGE DIFFERENCE in Ana and her children's lives. You TRULY CHANGED their lives!!! My brother and I really enjoyed being part of your team. THANK YOU FOR EVERYTHING!